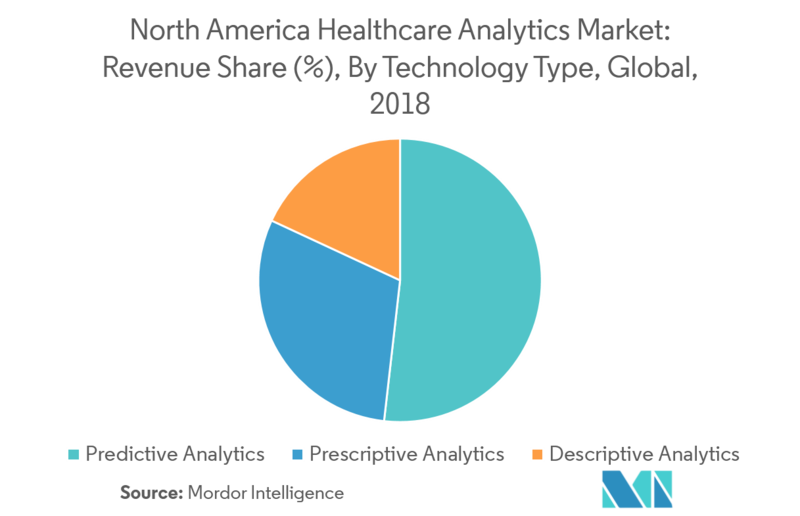 The North America Healthcare Analytics Market is segmented by Technology Type (Predictive Analytics, Prescriptive Analytics, and Descriptive Analytics), Application, Component, Mode of Delivery, End Users, and Geography. 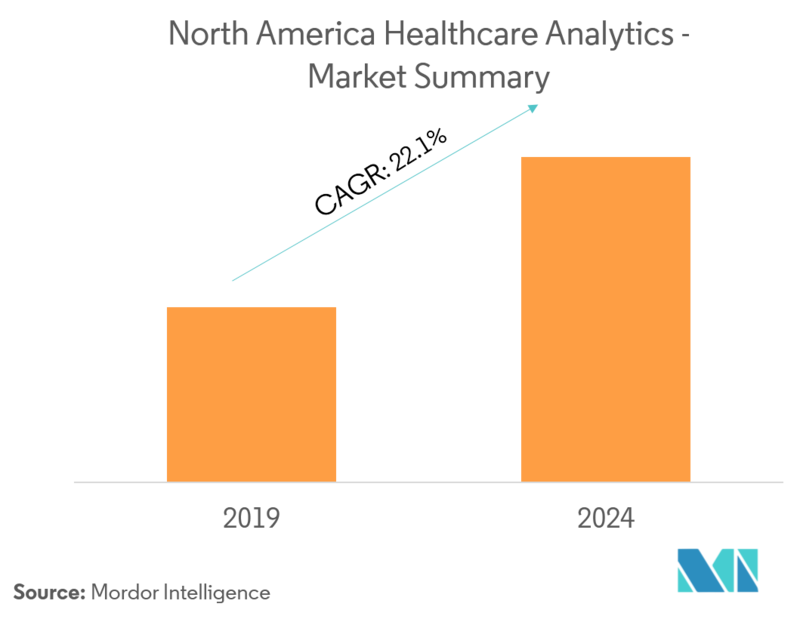 The North America healthcare analytics market is expected to register a CAGR of nearly 22.1% during the forecast period. The North American healthcare industry is exhibiting transformation from volume-based to value-based business. Improved quality healthcare, fraud detection, reduced length-of-stay in hospitals, and prevention of novel diseases are the main demands put forth by payers and providers. Federal healthcare mandates, quick return of investments, big data emergence, and digitalization of world commerce supplement the market growth whereas lack of patient data security, functional gap between payers and providers, and lack of reimbursement can hamper the market growth. Many federal policies, programs, and actions are being initiated by the governments of the North American region, to experience progress in healthcare services. For example, within the United States, the federal government has been encouraging the use of healthcare data through various policies and initiatives. Affordable Care Act (ACA), the most important healthcare legislation in the United States, authorized the Department of Health and Human Services to release data that promote transparency in the markets for healthcare and medical insurance. Furthermore, the government is offering incentive payments for healthcare providers to use EMRs and has taken necessary actions to liberate data (as part of a program to promote data release and accessibility) from agencies, like Centers for Medicare and Medicaid Services, the Food and Drug Administration, and Centers for Disease Control. Thus, government healthcare policies are propelling the market growth of healthcare analytics. Healthcare analytics is one of the major service platforms used in the healthcare segment for marketing of business software and consulting services. It widely uses data, statistical, and qualitative analyses, and explanatory and predictive modeling. The analytics help the healthcare organizations in reducing the hospital stays of patients, regulatory compliance, improving quality healthcare, preclusion of chronic diseases, and fraud detection. Predictive analytics, along with machine learning, is rapidly becoming one of the most discussed topics in healthcare analytics. Machine learning is a well-studied field, with a long history of success in many industries. The use of predictive analytics in healthcare can jumpstart the healthcare analytics market by improving chronic disease management, patient care, hospital administration, and supply chain efficiencies. In the healthcare industry, prediction is most useful when the predicted knowledge can be converted into action. Additionally, there is an increasing trend to utilize the available historical and real-time data, which is leading to higher adoption of predictive analysis in the health industry. 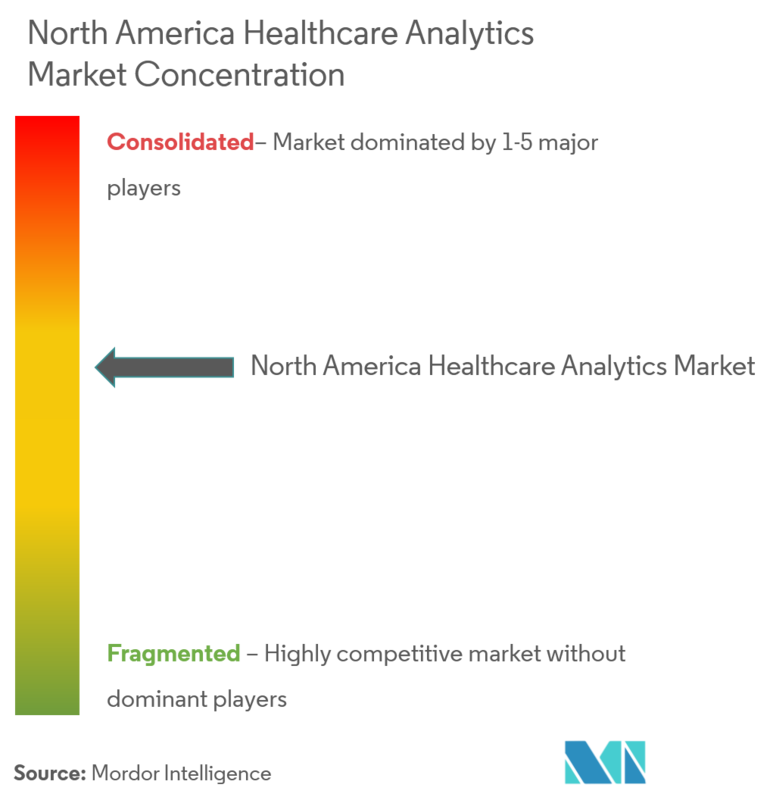 The North American healthcare analytics market is moderately fragmented, with some major players controlling a major share of the market, along with the presence of several niche players. Non-competing healthcare organizations partnering with each other, in order to manage the health of a population is a major trend that is been observed in the healthcare industry. Government payers, such as Medicare and Medicaid, are readily moving toward capitated payment and value-based-purchasing models, where outcomes may be measured and rewarded. For the success of these models, healthcare analytics is expected to be as important as the providers. The United States has the largest market share in the market studied, due to factors, like growing federal healthcare mandates, to curb rising healthcare costs and increasing patient quality care. The increasing regulatory requirements and growing EHR adoption are also contributing to its growth. The healthcare infrastructure in the United States is experiencing positive trends in the healthcare analytics domain. Healthcare organizations are also realizing that social determinants of health contribute to the wellbeing of a patient more than medical issues. In 2018, social determinants of health, along with drug usage and emergency room admissions data, rapidly drove the model for identifying cost risks of population clusters. The increasing use of data-driven techniques for healthcare decision making is expected to drive the market studied during the forecast period. Download the Market Share of key players in this industry.